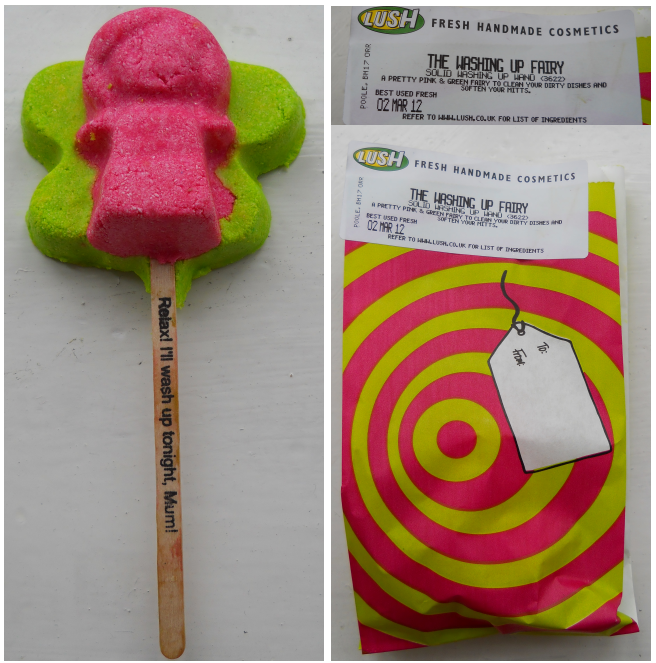 A few weeks ago, I decided to venture into the wonderful-smelling world of Lush for the first time since before Christmas, and before I descended on the poor Sales Assistants of Lincoln, I also decided that I would check out what exciting new products they had on offer, by taking a peek at their website. Now, I'm just going to say that I didn't actually get very far on the Lush website. Not because the website is rubbish, or wasn't working, or anything like that. But, because they made the absolutely fatal error of greeting me with a huge image of a great big fairy. Oh yes, you heard me correctly, a fairy. As you might guess, from the title, this cute as little fairy is for doing the Washing Up, although I didn't buy it for my Mum...this one was most definitely kept for myself! Although I was initially intrigued by this product, I have to confess that I had my reservations, purely over the longevity of the product. I mean, think of it this way: I currently use a standard, okay-smelling Fairy Liquid (sorry, this just makes me find the Fairy Wand even cuter, when you think of it alongside the Fairy Liquid Brand!!! ), that cost me something like £1 for two bottles (it was on offer a while back, and I stocked up because I am really that sad!! ), and anyone who has ever used Fairy Liquid (teehee! ), or has ever seen the adverts will know that Fairy "goes along way", it's their trademark and it really is true, because it lasts for flippin' ages! So, my chagrin was really the idea of forking out £3.75 for a product that may not last very long. I think my worry was really that this would be a Bubble Bar-type of product that crumbles and is gone fairly quickly. So, I asked one of the lovely Sales Assistants, in Lush, how long they lasted, and she assured me that the one she had been using, she'd had for at least ten days and it was still looking pretty much as it was, when she bought it (of course not entirely!). Needless to say, I gave it a try. One of my favourite aspects, of Lush, is always the sheer lack of packaging. I like that any packaging that is used (because it's impossible to be completely packaging-free, let's be honest) is usually paper-based, meaning recyclable or it can be re-used (as in the tins, that I think they still do!). The Washing Up Fairy is of course no different, because it comes with a recyclable wooden stick, that is absolutely necessary (you'll understand why in a minute), but won't end up on Land Fill. Oh, and the stick features the words "Relax! I'll Wash Up Tonight, Mum!" I can almost hear the mother's of the nation silently begging their children to buy this product for Mother's Day, if not for the product, for the idea that the kids might want to actually use it to do the washing up!!! Something else, about packaging, that I thought was quite cute, was how the paper bags that you buy products in, have a picture of a gift tag attached to them, where you can write who the product is for (if you're intending to give it as a gift) and who it has come from. This, of course saves on buying wrapping paper and gift tags, so another Environmentally Friendly addition! The Washing Up Fairy is an absolute doddle to use, because all you need to do is hold the product by the stick (see, I told you that the stick was necessary), and run the product underneath the running tap. The stick is even more useful when you're running the steaming hot tap, because it prevents your (or your childs) delicate little pinkies from getting burnt! The first thing that hit me, when I was running the fairy under the tap was the lemony smell that is just so zesty. It's funny how so many of us associate the smell of lemons with washing up, even though the product that I'd been using before wasn't actually lemon-based. But honestly, the smell is incredible. The only downside of the smell, is that once I'd stopped running the fairy under the tap, and I'd started washing up, the scent didn't seem to be quite as prominent. Maybe I should have used more product, I'm not really sure. The second thing that hit me, was how quickly and easily the product foams in the water. Initially, I wasn't sure if it would foam at all, but I did notice that it has SLS listed in the Ingredients List for this, so I'm not really surprised that it foamed. I always feel a bit weary when I see synthetic-based ingredients, in Lush products, however, we're all used to products like this foaming, so how many of us would moan if it didn't?? I thought it was funny (I'm weird okay?!) that the water turned a lime green kind of colour, because I didn't expect that. I loved the fact, however, that it made the water really soft. That might sound strange, but when you leave in a hard water kind of area, that is always a good thing, and I liked that after I dried my hands, they felt really soft and not quite as wrinkly as they normally would be after washing up. Of course, they were still wrinkly, just not as much. I think that this product is incredible. I've been using it regularly for just over a week now, and although the texture of the surface of the Fairy has changed dramatically (it has these weird bumpy bits in it, that I'd meant to take photos of, but I forgot! ), it is still pretty much a similar shade and size to how it was when I bought it. If that's not a sign of longevity, I don't know what is. I'd been a little concerned that the Fairy might come off the stick, however, it appears to be well wedged it between the pink fairy and the green wings, and from wiggling it about a little, it didn't appear to budge at all. So yes, overall, I am very impressed with this product. It's one of those gimmicky products that you do feel is going to be all gimmick and no action, but I was definitely proven wrong, and I really hope that Lush decide to keep this product on, after Mother's Day, because it really is an ingenious idea. Of course it's a tad expensive, but let's face it, environmentally friendly products generally are more pricey. You can pick up this amazing Washing Up Fairy, for £3.75, from the Lush website or from your nearest Lush store. 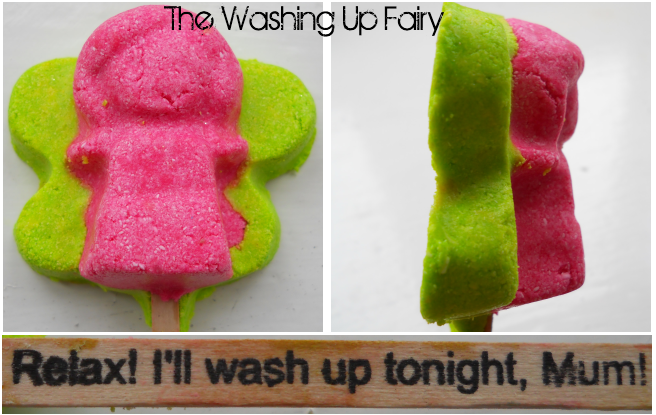 Have you tried out Lush's Washing Up Fairy? Would you buy this for your Mum, or for Yourself?